A great hill in the north east. Chapel Fell climbs 327m in 2.4 miles of tough climbing. Turning off the A689 from Stanhop to Wearhead, the climb heads south east towards the Penine hills. It never gets super steep, but is hardest near the summit, just when you are exhausted from the previous climbing. After a relatively gentle introduction, it hits 15% for the last 1 km of the climb. 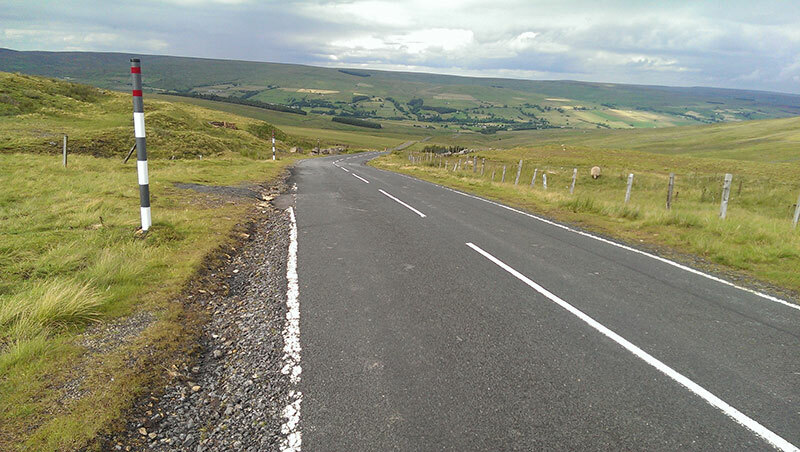 The climb takes you to the top of Harthope Moss, which divides Weardale to the north and Teesdale to the south. It is quite a remote place in the middle of the Pennines. It is one of the highest paved roads in the UK. It starts at 1,000ft and finishes at 2,110ft (623m) so it can be quite blustery as you would expect a high point of the Pennines to be. There are great views of the surrounding moorland on a good day.